Originally from Erie, Pennsylvania (the OFFICIAL snowiest city in America! 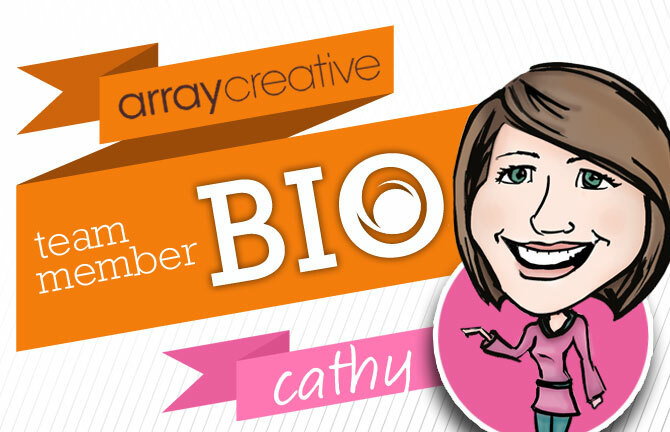 ), Cathy moved to the Akron area almost 4 years ago to join Array Creative. With a BFA in graphic design, an MA in Communications and design experience in the non-profit, higher-education and publication sectors, Cathy was an ideal, well-rounded fit for the team. Steadily working up the ranks, Cathy has had a hand in building brands and client relationships. And as Cathy is poised to transition into more of a Marketing role with Array, she’s also getting ready for a big change in her personal life – she’s expecting her first child! Her husband Shaun (and even their pup Sophie!) are over-the-moon excited to welcome their new bundle this June. I can now! There are a lot of things you can’t eat while pregnant I’ve learned. Definitely my husband – he truly is my other half. Something country. Shawn and I are slowly working on converting the office to our John Deere driving, cowboy boot wearing ways. Glitter. Is glitter a color? Yes, each and every dinner. But I’d love to be more adventurous. My Pinterest boards are full of recipes I’d love to make – actually, they’re full of crafts and DIY projects too that I’ll probably never get around to creating! Beer-garitas. Beer, tequila and limeaide – the perfect summer drink. If it has to do with babies and pregnancy, it’s on my nightstand. Ian and Shawn assure me that if I want my baby to sleep through the night, Baby Wise is key. We’ll put that theory to the test very soon. My honeymoon – Riveria Maya, Mexico. In a word: AMAZING. But this fall I’m headed to wine country in California for a family wedding – I can’t wait!